These working class guys are not so different than from the characters you know and love from The Full Monty. They are okay with working hard, but even better at playing hard. Unfortunately, the entire work force of their Shanxi coal mine is about to be laid off. 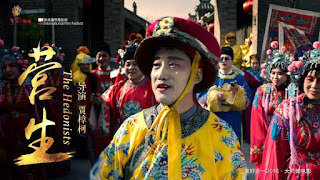 That means they will be forced into job-searching mode in Jia Zhangke’s The Hedonists, which screens as part of Shorts Program 2: International Auteurs at the 54th New York Film Festival. Some of the three pals worked more diligently than others, so the manager (who should be feeling more embarrassed than he appears) takes varying degrees of satisfaction pink-slipping them. In between boozy hands of mahjong, they duly scroll through job listings on their smart phones. Even though they are middle-aged and out of shape they apply for a bodyguard position, protecting a nouveau riche “Big Boss,” played by Jia himself. When that misadventure fails to pan out, they apply for costumed performer jobs at a Ming Dynasty theme park, harkening back to Jia’s masterful The World. Co-written by Jia and his muse/life partner Zhao Tao, The Hedonists is a slyly amusing, deeply humane examination of structurally unemployment in contemporary China. Jia proves he still has the masterful touch for short subjects he displayed throughout the elegant Cry Me a River, but in this case, the ending is so abrupt, it makes one wonder if there is a feature-length third act missing. Still, Hedonists is ironically notable as one of Jia’s most visually cinematic films, with more sprawling crane-shots stuffed into its twenty-five minutes than you will find in most of his features. Conceived as part of the Beautiful 2016 anthology film project, The Hedonists is obviously also screening as a discrete short in its own right. It will not disappoint Jia’s admirers (although they will probably miss Zhao’s luminous screen presence), but it seems odd NYFF chose not to bring the entire anthology, considering it also boasts a brand spanking new Stanley Kwan film. Nonetheless, Jia certainly fits the International Auteur rubric (perhaps better than any of his program mates). Highly recommended in any screening format, Jia’s The Hedonists screens this Saturday (10/1) and Sunday (10/2) as part of Shorts Program 2, at this year’s New York Film Festival.